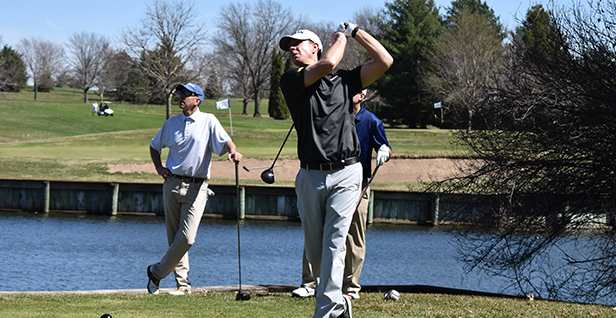 Muscatine, Iowa – Iowa PGA Members Sean McCarty and Chris Brueggeman won the Iowa PGA Pro-Pro #2 at Muscatine Municipal Golf Course on April 8. Teams for this event were paired via blind draw and played in a one best ball of two gross format. McCarty of Brown Deer Golf Club and Brueggeman of A H Blank Golf Course combined for eight birdies and an eagle on the par-5 10th hole for a 9-under-par 63. The Iowa PGA Pro-Pro #2 marks the first win of the year for McCarty and Brueggeman. The teams of Darin Fisher and Ryan McClintock and Paul DelVecchio and Jeff Schmid tied for second at 8-under-par 64. Both teams finished today’s event bogey free with eight birdies. In addition to the team event, the Iowa PGA Pro-Pro #2 featured individual competitions for the Open, Senior and Super Senior Divisions. Jeff Schmid of the Brown Deer Golf Club claimed the Open and Senior Division with a 7-under-par 65. Schmid carded a bogey-free round with seven birdies, including five on the back the nine. The Iowa Pro-Pro #2 marks Schmid’s first victory of the 2019 season. McCarty finished in second place in the Open Division with a 6-under-par 66. He recorded six birdies on the round and added an eagle on the par-5 10th hole in his second Iowa PGA event of the season. Chad Proehl took third place at the Iowa PGA Pro-Pro #2. He carded five birdies, including two-in-a-row on Nos. five and six. Proehl added an eagle on the par-5 10th hole for a 5-under-par 67. Dillion Baker and Darin Fisher rounded out the top-five of this tournament. They both finished with four birdies, two on each nine, to finish at 3-under-par 69. Larry Castagnoli and Joe Butler tied for first in the Super Senior Division. Both Castagnoli and Butler carded 1-over-par 73s. Castagnoli registered three birdies in route to his first victory of the season. Butler recorded one birdie in the Iowa PGA’s second event of the year. The Iowa PGA would like to thank Dave Crawley, PGA and the entire Muscatine Municipal Golf Course for hosting this event. We would also like to thank Marc Cruse and Waskom Grip Company for sponsoring this event. The Iowa PGA season continues next Monday, April 15 with the Iowa PGA Pro-Pro #3 at Lake Panorama National GC in Panora, Iowa. Registration for this event closes Tuesday, April 9 at 11:59 p.m. Click here to register.